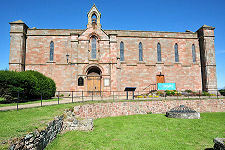 Coldingham Priory stands close to the centre of Coldingham. Access to the large churchyard that surrounds it is through a gate leading from the east end of the car park close to the junction between the A1107 and the B6438. 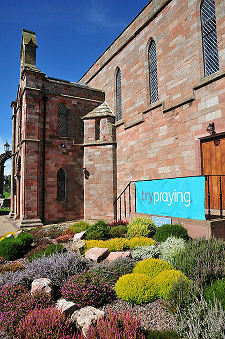 What you find is an intriguing, basically oblong, church, constructed of pinkish stone. The windows that line the upper half of all four walls have been protected by external fibreglass covers that give the impression they have been boarded over: but if anything this simply adds to the air of mystery that surrounds the church. 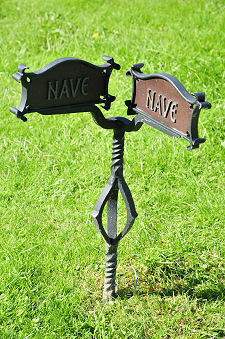 Much of this sense that there is more here than meets the eye comes from physical evidence on the ground. The path leading to the church passes through a free standing arch that was very obviously once part of something much larger, while nearby are the base courses of some very substantial columns. Also nearby is a slightly spooky assemblage of bits of worked stone, headstones and even a stone coffin lid, all stuck together along one side of an old wall. What you see today is actually the end product of the better part of 1,000 years of building and rebuilding on this site, interspersed with all too frequent destruction caused by attacks from passing armies, by the Reformation and even, on one occasion, by its own prior. 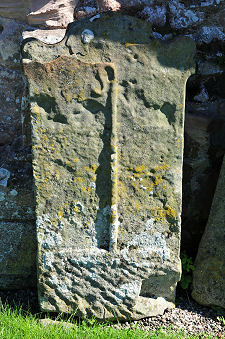 The starting point for the story of Coldingham Priory is in 635, when a monastery open to both monks and nuns was established two miles to the north near St Abbs by a Northumbrian Princess called Aebbe. She was later made a saint, St Aebbe. In 683 fire largely destroyed the monastery. At the time some held this to be divine retribution for what was, perhaps euphemistically, called "disorderly behaviour" among the monks and nuns there. 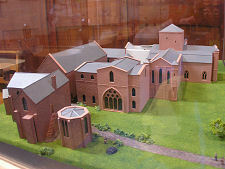 Whatever the truth of this, by one account the monastery was soon rebuilt, though only for nuns. This account goes on to tell how Vikings completely destroyed the monastery in 870. In 1098 King Edgar asked the Benedictines at Durham to establish a foundation on a site a little inland from the earlier monastery. By 1100 what is referred to as The Old Church had been built, covering much of the area of the church you see today, though rather narrower than it. By 1147 this had developed into a priory under the authority of Durham. 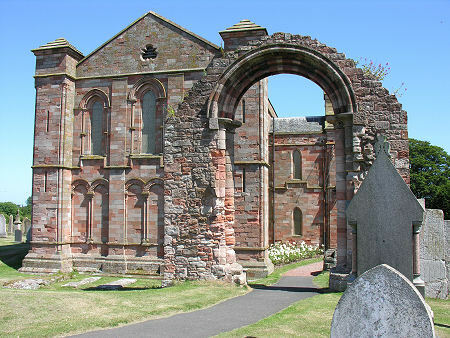 In 1216 Coldingham Priory was destroyed by King John of England. 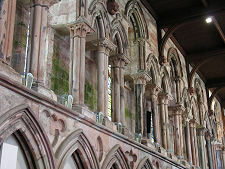 It was quickly rebuilt on a very much grander scale, incorporating a huge priory church. 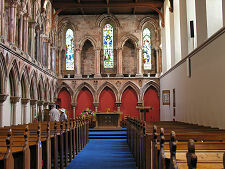 The church you see today shows the size of the choir of the 1200s church, and incorporates two of its walls. To get a sense of the scale of the whole building you have to imagine a tower at the west end of today's building, large transepts to the north and south of the tower, and a nave, longer than the choir, extending still further to the west. 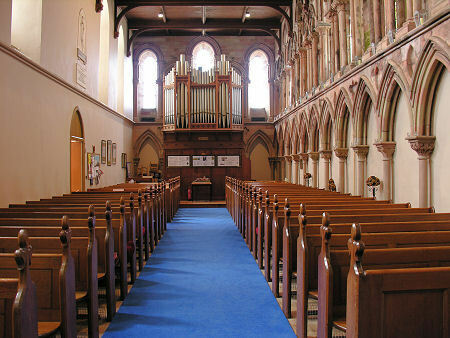 The nave was in turn flanked by broad aisles. If you look for them you can find metal markers in the graveyard showing where the western corners of the nave and aisles once stood, and from here the large scale of the church really does begin to become clear. In 1430 part of the priory was burned down by its own prior, William Drax, possibly in an attempt to conceal his theft of a large amount of money being carried by a messenger from the Scottish King to the English King. 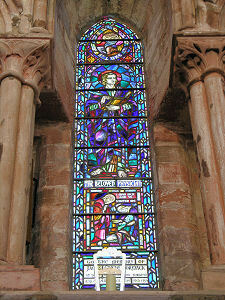 In 1509 the priory was finally detached from Durham and placed under the authority of Dunfermline Abbey. Invading English armies damaged the priory in 1537 and 1547 and it seems to have been already fairly run down by the time of the Reformation in 1560. The finally blow came in 1650, when troops opposing Cromwell were positioned in the priory. After a two day siege by Cromwell's artillery, little was left beyond the north and east walls of the choir. 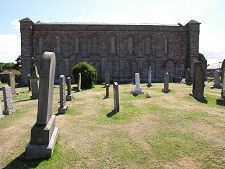 In 1662 new south and west walls were built, allowing the choir of the church to be returned to use as a parish church. 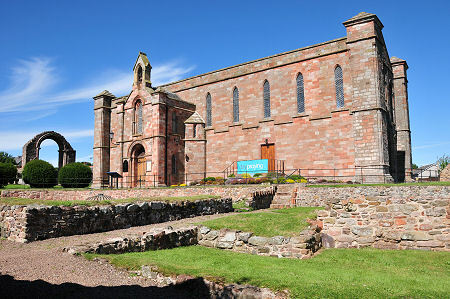 These walls were rebuilt in the 1850s, when the priory assumed pretty much the form you see it in today. 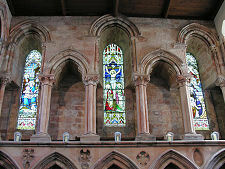 The column bases south west of today's church were formerly part of the south transept, and parts of the south and west walls of the south transept also remain: as does the arch that once connected the south transept to the south aisle of the nave. Of the domestic buildings that once surrounded the cloister garth south of the church, the low walls and foundations you see today are all that remain.